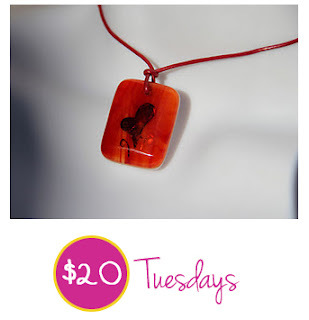 Here is the first $20 Tuesdays deal of our Deals and Steals promotion! This pretty little heart is painted in liquid platinum between two layers of glass - a streaky transparent red on top and a white layer underneath to create opacity. The platinum shimmers and gives the heart a life of it's own. Red leather cording, and perfect for Valentines Day. **This is the only one** If you want it, click here before someone else does! Good luck!